Astrology Books and Horoscope Guides for Capricorn. Saturn rules the practical sign of Capricorn and controls the month of January. You are strongly motivated to succeed, and with dedication you will gain a position of power and respect in life. You are gifted with computers and you possess strong morals and organizational principles. More than any other sign of the Zodiac, you strive for respect and accomplishments. Saturn is a karmic planet and rules your life, thus you must avoid nurturing depressing thoughts. The part of God in you is much stronger than the stars you inherited and you do have the power to master and use the Cosmic Code at your advantage. You were born in the middle of the winter when nature was asleep. You must have realized early on that nothing would come easily to you. Like the goat slowly but surely and against all odds (cold/wind/snow), you must climb towards the top of the mountain. The first part of your life will be a long and painful struggle, but Saturn will reward you by giving you a long life and a well-deserved position at the end. You will appreciate old age and solid financial security. You may also marry a much younger or older partner. The fluctuations of the Moon strongly affect your mood and career success. The wise Capricorn soul will use his fish tail accordingly and synchronize his life and business with the Universal tides. Steadiness, organization, patience, and charm belong to you. You have a strong architectural or mathematical ability and your keen sense of observation will help you succeed in life. Karmic Saturn will exact payment for manipulating others for selfish ends and will throw the soul back to a painful start. You are attracted to power and successful people and you may marry into wealth. Emotional and sensitive, you are very responsible and protective of the family circle. However, you must learn to openly communicate your deep feelings. Your real gifts are in your mind, Psychology, Astropsychology, interior designing, engineering, electronics, movie producer and any career related to Uncle Sam. Your own natal Dragon can propel you to the highest position and supreme power if you use it accordingly. But your challenge is to open up to the intangible world of the spirit and its accompanying Universal rules. Your natural tendency to organize people and business at all times could hinder your sensitivity to others. Capricorns are good homemakers and adept with investments. As a rule, you favor a successful business environment where you can apply your tremendous organizational gifts. A word of caution for Capricorn: Be aware of those wild acquaintances willing to help you to climb the ladder of success or the traps of religious poisoning. Remember to respect the Universal Law (see Moon Power), as your awareness of Moon planning will become a major contribution for happiness and success. The location of your natal Dragon's Head or Tail will seriously alter the strength or weakness of Saturn in your chart. The downfall of your spirit is religion and/or chemical addictions. Rush Limbaugh, Dr. Laura and Mel Gibson are good example involving religion and/or chemical substance abuse. You can learn much more about yourself or anyone else by ordering Dr. Turi's most popular books: Beyond the Secret , I Know All about You: The True Power of Astropsychology , The Power of the Dragon , And God Created The Stars . 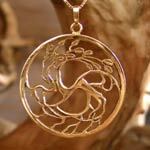 Capricorn is one of the most stable and most serious of the zodiacal types. They are normally confident, strong willed and calm. Hardworking, unemotional, shrewd, practical, responsible, persevering, and cautious to the extreme. Capricorn is associated with the Greek myth of the goat Amalthea, who provided the infant Zeus with milk, or ambrosia in some versions. Zeus placed her in the sky to honor her. Capricorn is also associated with the god Saturn and the god Aristaeus. The Babylonian zodiacal sign is called šaxû "ibex". The sun in this month entered the suxûru-fish constellation, called the star of Tashmetum, the wife of Nabu. The goat-fish is known from depictions on Babylonian monuments. Capricorn is also linked to the Greek God, Pan. The astrological symbol for Capricorn represents the horns and tail of the goat-fish or sea-goat. The 10th House is the house that the Capricorn rules. 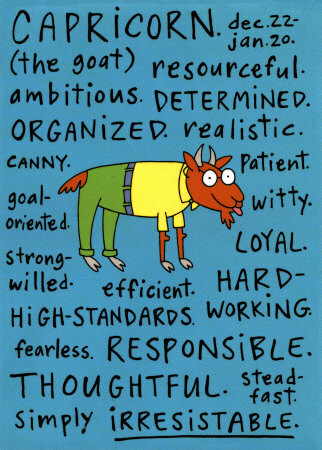 It represents everything about an Capricorn, like birthdays, numbers, etc. The 10th House represents goals and ambitions, direction in life, status in society, and profession. People born with their sun sign in the 10th house, even if not a Capricorn, have the personality traits of a Capricorn. 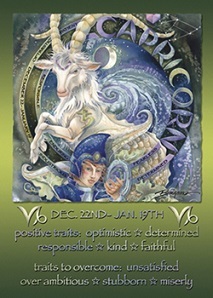 Astrologers generally agree that the following are attributes of Capricorn: prudent, responsible, realistic, very wise, formal, patient, methodical, disciplined, traditional, cautious, conventional, hard-working, polite, persevering, ambitious, dedicated, focused, honest, dependable, serious, self-reliant, businesslike, career-oriented, authoritative, conscientious, and competent. They can also sometimes be rigid, suspicious, status-seeking, demanding, insensitive, inhibited, cold, dry, aloof, lack of emotional depth, possessive, self-conscious, materialistic, narrow-minded, vindictive, bitter, lacks hope, melancholy, stuck-up, controlling, harshly critical, restricting, calculating, and saturnine. Capricorn Likes - Romance, Loyalty, Feeling secure, Financial/material stability, Ambitious mates, Feeling committed, Making long term relationship plans, Dependability, Reliability, Perseverance. Capricorn Dislikes - Flightiness, Being bossed around, Crudeness/coarseness, dominance, Game playing, Ego displays, Extravagance, Being challenged by a lover, Indecisiveness. Suitable occupations are where responsible, patient and practical qualities can be exercised; such as scientist, engineer, manager, civil servant, mathematician, farmer, builder, politician, director. In medical astrology Capricorn governs the knees and skeleton. Astrologers believe that each sign of the zodiac has identifiable physical traits that manifest themselves in the ascendant, which is different from the sun sign. Physically, individuals born with an ascendant of Capricorn have steady eyes, a light caramel complexion, capable hands, and prominent cheekbones. Men and women both tend to be thin and wirey. In terms of Mundane or Political astrology these countries are associated with Capricorn: India, Mexico, Afghanistan, Bulgaria. The Indian Vedic equivalent of Capricorn is Makara; the Chinese equivalent is the methodical Ox, whose lunar month is 6 January - 3 February. Pet Sitter, Caregiver, Nanny, Housekeeper, House Cleaning, Laundry Services.